Posted on Sat, Aug 31, 2013 : 5:40 a.m.
“SightSee” at the Ann Arbor Art Center wants us to consider the landscape genre in decidedly different ways than we’re accustomed to seeing. The exhibit consists of work by Eastern Michigan University art professors Colin Blakely and Amy Sacksteder. Divided by alternating heroic-sized digital photography and mixed-media paintings or drawings in the Art Center’s upstairs gallery, the display is an expansive (if not also quirkily expressive) study of our country’s landscape with a lot of interpretation tossed in the mix. “SightSee” is therefore a heady mix of feisty aesthetics whose abundance of spirit reshapes the notion of our countryside in such a way as to comment on the time-honored notion of the sublime through art that forces us to see the world around us anew. Sacksteder’s half of the proceedings are measured in such a way as to reinterpret commonplace representations of the environment. As such, her “landscapes” work in differing scales with differing iconographies. Their only commonality is her willingness to work abstractly rather than try to conform to a conventional set of symbols. “I’m attempting,” says Sacksteder in her artist’s statement, “to reconcile vitality and mortality (and their accompanying celebrations and mourning). I’m interested in records and relics of past events, of lived histories, of significant sites. "Tahoe," Sacksteder’s 22-by-30-inch gouache and ink on paper with silver leaf cut out, is an admirable example of her work at its most intimate and hermetic. This handsome painting/drawing doesn’t give us a representational view of this famed Sierra Nevada Lake. Rather, the artwork’s jagged paper bottom border gives us an inferred sense of the mountainous terrain surrounding the lake. And the mottled cloud on the work’s left side is superlatively matched against a band of colorful diagonal stripes whose explosive aggregated splotches surge from a solitary vertical stem. .” mixed-media installation that stretches across the expanse of the Art Center’s east gallery wall: Free-associate as you like. .” finds Sacksteder setting small mounds of stone cairns across the length of the gallery with a number of varied wall-mounted drawings, paintings, and manipulated photographs in differing styles of representation and abstraction set around three paintings (“Net 4,” “Tahoe,” and “Pyramid”). This landscape by other means is indeed the sum total of the installation; giving us varying perspectives to suit our study. Colin Blakely’s oversized digitally manipulated “Constructed/Disruptive Views” photography, on the other hand, seems resolutely conventional in contrast to Sacksteder’s paintings and drawings — well, conventional until they’re studied a bit more closely. First, a word about scale: Blakely’s digitally manipulated photographs emulate an oversized scale analogous to that of 19th century American landscape genre painters. It’s therefore not accidental that he specifically references Albert Bierstadt and Frederic Edwin Church in the titles of two of his artworks. Couple these homages with our country’s reverence for our environment and Blakely’s hit a nerve that thoroughly resonates with our culture. And as Blakely says in his artist’s statement of his “Constructed/Disruptive Views” series: “The series centers on depictions and interpretations of the landscape. Distinct from the notion of land, untrodden by human feet yet completely ravaged, the landscape exists only as an embodiment of our collective cultural imagination. 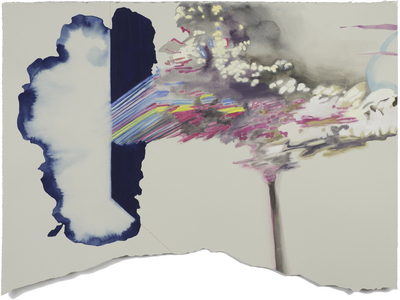 For example: Blakely’s 30-by-36-inch black and white “Convergence Disruption I and II,” disrupt his landscape composition through a frequency wave that manipulates the very surroundings illustrated. 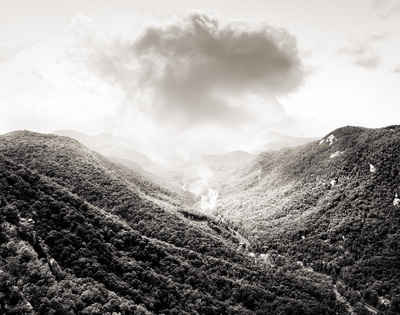 And the 33-by-22.5-inch “Figure/Ground Compression IV (Chimney Rock)” subtly alters the photograph’s monochromatic palette to enhance the landscape’s dramatic appearance. Blakely’s masterwork in this exhibit is “Yosemite (after Church)” whose 42-by-52.5-inch color digital photography depicts the park’s famed Tunnel View looking towards Yosemite Valley, El Capitan, Bridalveil Fall, and Half Dome. But in keeping with Church’s spiritual impulse, Blakely manipulates his image to create a series of interior receding visual planes that draw us into the heart of the composition until Half Dome almost disappears from our sight. As Blakely’s masterly “Yosemite (after Church)” shows us: It’s not nearly enough to merely have sight. We must also quite carefully see if we’re going to participate in the imaginative element of American landscape art. “SightSee: Colin Blakely and Amy Sacksteder” will continue through Sept. 15 at the Ann Arbor Art Center, 117 W. Liberty St. Gallery hours are 10 a.m.-6 p.m. Monday-Thursday and Saturday; 10 a.m.-8 p.m. Friday; and noon-5 p.m. Sunday. For information, call (734) 994-8004.